As Sara Morrow said in Modern Farmer, "Leave it to a woman to revolutionize cattle ranching." The woman she was writing about is Anya Fernald. Fernald has been roaming about the food world for many years from traveling around Europe offering help at dairy farms, to working in Italy with Carlo Petrini and Slow Food, to bringing Slow Food to America, to being a judge on Iron Chef, to running a cattle ranch. I'm already tired! As CEO of Belcampo, Fernald set out to develop a source for pasture-raised organic meat. There was a farm, then a slaughterhouse, then a butcher shop and restaurant, then multiple locations -- even a resort in Belize, and now, a cookbook. Home Cooked is just that, home cooked recipes without fuss and flourish. 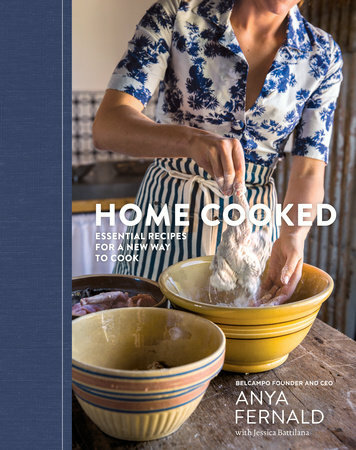 What the recipes do posses is bold flavor that comes from fresh ingredients and a firm lack of fear in using everything her animals have to offer. There are no foams or tweezers in Fernald's kitchen, there is fire and flame; braises and confits; beef and vegetables covered in sauces and soaked in wine. It seems that on any given day, a party is just around the corner! I know one can't, as they so often say, judge a book by its cover, but I love giant, nested bowls, and have some of the same bowls on my shelves, not to mention a beaten up wood table. Also, my favorite recipe in the book is one of my fave recipes. As a child, I never had to eat anything I didn't want to eat, but I had to try everything. It made me an adventurous eater from the start. You might think that whole animal cooking and braised veggies with garlicky sauces might not be something your family wouldn't eat, think again. Fernald has small children and (aside from being one of my favorite foods) this recipe is her daughter's favorite. I like my chicken hearts skewered on stalks of rosemary, but brown butter has a certain appeal. Fernald warns that the hearts should never be cooked beyond medium-rare. So remember, brown on the outside, pink in the middle. In a small cast-iron skillet over medium-high heat, melt the butter. When the milk solids are beginning to brown and the butter has a rich, nutty smell, add the chicken hearts and cook, tossing them around in the pan as if you’re making popcorn, until browned on all sides, no more than 2 minutes. Remove from the pan with a slotted spoon, sprinkle with flaky salt, and serve immediately. Hey, organic meats, big bowls, chicken hearts, we so want to party with this girl. You will, too. Thank you so much for introducing us to this book. 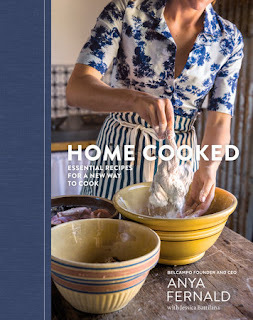 I have heard of Anya Fernald from Iron Chef but I had no idea she was so involved with the Slow Food movement.